The front page of newspapers and the top stories on the Internet, social media, or television seem to focus on simmering crises, crime, accidents, politics, the economy, and prominent people behaving badly. Our conversations at work and home begin to dwell on these issues, and it’s enough to discourage anyone. Where can we turn for better news? I have learned that no news is better than new-news. Sometimes we need to unplug; turn off the TV and shut down the devices and plug into God’s word. John 14:1 says, “Don’t let your hearts be troubled. Trust in God [Word], and trust also in me [Word].” Daniel Habben said, Stay plugged into God’s Word. That’s what brought us to faith and that’s what will continue to sustain us in the days ahead. The great thing about the power of God’s Word is that it’s free. While the cost of heating and powering our homes may be on the rise, the cost of strengthening and maintaining faith will never change. God’s Word is not only free; it’s reliable because it endures forever. 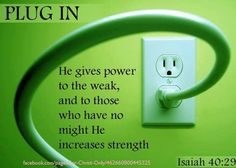 Therefore those who plug into the Word will endure forever as well.